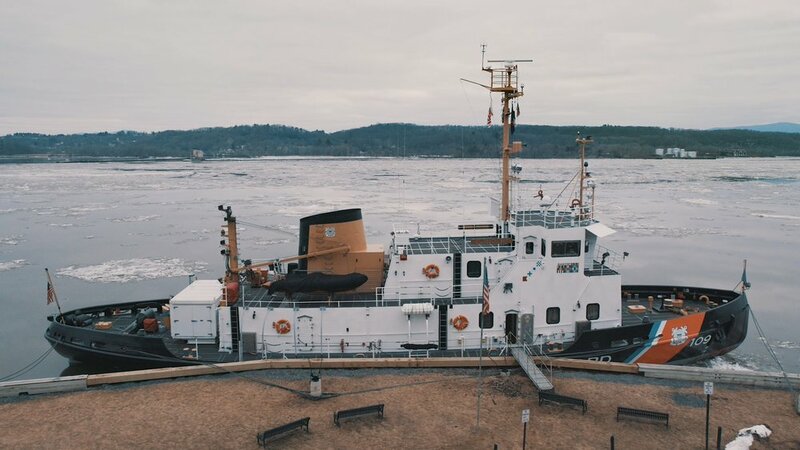 COLD HUDSON is an observational documentary that explores the beauty, history and geography of the Hudson River by way of the United States Coast Guard Cutter (USCGC) Sturgeon Bay as it cuts ice along the river on a cold winter day. 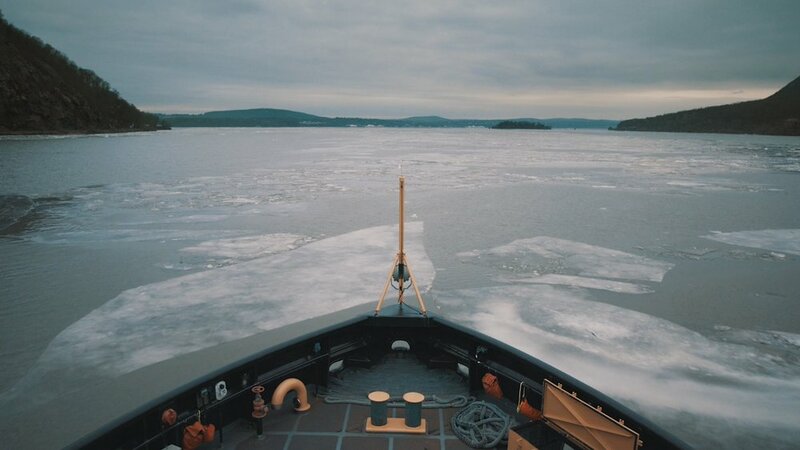 Cold Hudson is a seven hour journey up the Hudson River aboard the Coast Guard Cutter Sturgeon Bay on a frigid February day. Starting in West Point and terminating in Rhinecliff, this observational film lets us meditate on our relationship to nature while we meander along New York's historic waterway. PBS WLIW21 to premiere 7 hour slow film COLD HUDSON commercial free on Thanksgiving day beginning at 11:00am. Over the past 6 years, Slow TV has gained momentum as a new and different way to air content. Public Broadcasters have led the charge starting in Norway in 2009 (Bergensbanen – minutt for minutt, Norway), France 4 in 2013 (Tokyo Reverse) and a slew of new titles on BBC (BBC Goes Slow). This new broadcast medium allows viewers to patiently explore a place in real time through long form observational films. PBS has a long history of supporting experimental programming that challenges perceptions of audience taste. In a recent article about the origins of reality television, of which Slow TV is a derivative, The Washington Post (November 8. 2017) said, “PBS had the flexibility to broadcast an experimental program that challenged audiences without pressures from advertisers that preferred to sponsor comfortable, traditional content”. WLIW is continuing in this tradition by supporting the Thanksgiving broadcast of COLD HUDSON. COLD HUDSON is a Slo.Media production. Slo produces and promotes minimal, real-time films that employ natural aural aesthetics and stunning yet honest visuals to elevate the seemingly mundane. Story and structure become optional, completely subjective and interactive. We believe there is meaning, knowledge and perspective to be gained from taking time to observe - and that can only happen if we choose to slow down. Slo produces interactive sound recording workshops and has produced installations for FILMGATE (Miami), Camden International Film Festival (Camden, ME) and the MASS Production Coalition (Boston, MA). SLO is based out of Boston, MA. This #thanksgiving we're thankful for @ben_pc , @lenmazzone and the @USCG_Tri_State for their help with #COLDHUDSON two years ago! Billy Wirasnik is a filmmaker and sound designer for documentary films & podcasts. His profound connection to the Hudson River began during his childhood growing up in Kingston, NY, a small city situated on the Hudson about 100 miles north of New York City. His production company, Slo, produces and promotes minimal, real-time films that employ natural aural aesthetics and stunning yet honest visuals to elevate the seemingly mundane. He has directed several short narrative films, and is a sound designer for documentary and commercial films. He was an early participant of interactive documentaries, working on story development and sound for Good Luck Soup and the Emmy nominated and Peabody award winning HOLLOW. He currently sound designs the podcast, EF Outbound. COLD HUDSON is his directorial debut and most ambitious film project to date. Music: Colleen - "Holding Horses"
Thank you for reading and have a wonderful slow day!